16. ZAHAVA SEEWALD/MICHAEL GREBIL - Who Can Look at the Beauty of an Ocean? 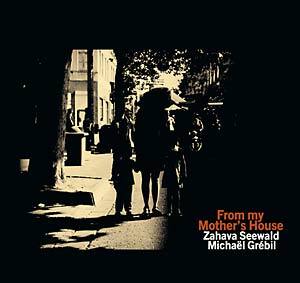 Following up on their 2005 Tzadik release Scorched Lips, Zahava Seewald and Michaël Grébil have delivered a new collaboration exploring more intimate spaces. From My Mother's House is haunted from within by a sustained breath that unfolds through Jewish poetry. This work can be experienced like a novel, a piece of prose, a Hörspiel, an introspective form of cinema for the ear. The music unfolds in layers, like entangled photographic impressions. Field recordings, poems, film quotes, instrumental music, document archives, and concrète sounds are conjured up in a disorganized fashion, on a single plane of existence. Each element contributes to the whole, with the same basic intention: all these worlds coincide and exist in a single space, forming what could be called a sonic Menschmozaik. Images emerge and intermingle to form deeper, more complex pictures, through a series of associations. And this flow of conscience carries a dialogue where the voice of the living answers the voice of the dead, sonic matter being their point of contact, a ferryman, an intimate landscape; a gleaner harvesting layers of memories buried in the past along with still-fresh layers deposited by the present. Sound becomes a receptacle for the word, and the voice becomes the contemplator of the landscape getting sketched. Then, base lines get drawn, like so many themes developed by the poetry: the long thread of generations unfolding, parentage, the dialogue between a mother and her daughter, the daily life, the trite, the terrible, death, barbarism, beauty, innocence, the mother tongue. Sehnsucht.